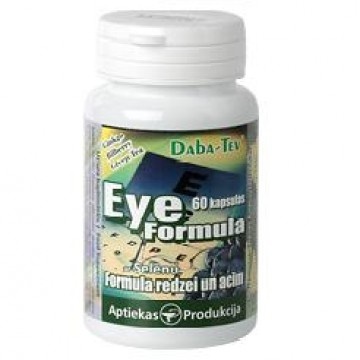 The product combines antioxidants and biologically active substances for visual functioning. Bilberry Extract and vitamin A stimulates the visual pigment - rhodopsin synthesis, which is specifically required for normal vision in low light. Lutein is carotenoid which determines the color and capabilities of a yellow point (specific place in retina of the eye that provides the main functions of vision), as well as works as a natural "safety glasses", shielding the eyes from the adverse effects of the glare. The product ingredients: ginkgo, green tea extracts and eyebright extraxt, folic acid, and citrus bioflavonoids complex works synergistically making a good effect on visual function. Physiological effects: retinal yellow spot (macula lutea), with a macural hole in the middle (the most important place for visual acuity) contains natural light filter that holds solar spectrum UVA and UVB rays. This filter consists of orange pigments - the carotenoids lutein and zeaxanthin (lutein in is not synthesized in a human body, it is primarily taken with food; zeaxanthin is synthesized in the body from lutein), which together with the antioxidant system protects the retina. The pigment density decreases in macula of an impact of sunlight and free radicals; this causes progressive degeneration of the macula, which in turn can cause central vision loss. Scientific studies have approved the lutein protective effect on the retina. Thanks to the P vitamin similar activity anthocyanins and flavonoids (which contains blueberries, green teas, ginkgo biloba extracts) strengthens the walls of blood vessels and regulates their permeability. Anthocyanins and flavonoids have regenerative properties of the retina. Plant extracts, as well as zinc and vitamins in the product are antioxidants that protect eye tissue from the adverse effect of free radicals. Instructions for use: take 1 to 2 capsules daily or as recommended by your doctor. Do not exceed the recommended daily intake. Do not use this product as a full substitute for a balanced diet. Store carefully closed at a room temperature; keep out of reach of children. Do not use if package is damaged.